You do always look like you are smiling. Hi Pancho, you sweet, fluffy ball of postiveness and happiness! Happy Pet of the Day! What a beautiful, pawsitively precious little pig you are, Pancho; purr-fection on 4 paws! Having been mom to many wheekers over the years I know just how special you kids are, and so learning of the very special place you hold in your human's heart, the happiness you bring to her days, comes as no big surprise! When I got him I decided finally to learn what their singing-like sound means so I was listening to records of guinea pigs' sounds with explanations on the internet. It was very funny when he started 'to answer' so this. Now that made me smile! I did the very same thing after bringing home my first pig, Squeaker: researched the many different guinea pig sounds then played them for him! Him answering back was so cute! You human is one lucky soul, having a furkid, a best furry friend as beautiful, as sweet and loving, as special as you, Pancho! You truly are a treasure, and so very deserving of your big day of honor! Thanks for the BIG smiles, cutie pie! Meeting you today, seeing your heart-melting photos has been a real treat! I hope you're enjoying a very special day of celebration...being treated to some extra floor time (then right into your human's arms, hehe), munching on some juicy cucumber, being loved and pampered to pieces! Lots of love, cuddles and kisses to you, precious Pancho, our very special and most deserving Pet of the Day, EVERY day! Happy Pet of the Day, Perfect Pancho! Dearest Pancho, you are perfect, indeed! What an adorable Guinea Pig you are, with that beautifully colored, soft-looking fur and that sweet face with the cute pink nose and the lovely big eyes. And what a delightful personality you have! You're very social and friendly, always seeking attention, and you don't mind being hugged. And what an interesting story of your person listening to records of guinea pigs' singing-like sounds on the Internet, and you starting to "answer" the sounds! And since then, he/she sometimes plays the records so you don't feel lonely. You both love each other very much, don't you. What a wonderful love-filled home you share! 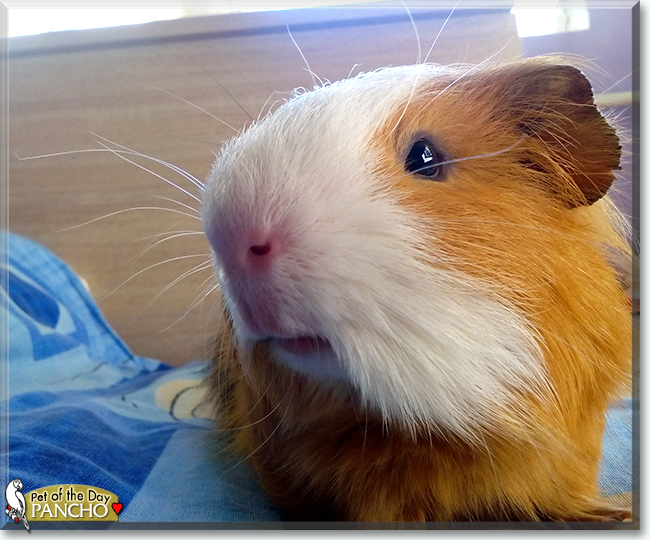 Congratulations, darling Pancho, on being chosen today's Pet of the Day! We hope you and your dear person and all your family and friends are enjoying a fine celebration, full of fun and lovies and all your favorite games and treats, maybe even a special serving of cucumber!